Eating breakfast food at dinner sort of feels like you’re getting away with something. What’s really fun is eating foods that you don’t even normally eat at breakfast, usually because they have too many calories! When I was in college, one of my favorite memories is when my older sister used to invite me over to her house every Sunday night for sourdough pancakes. Sourdough pancakes loaded with butter and real maple syrup have to be like a little preview of the Kingdom! I remember as a kid that my mom used to make milk toast for dinner sometimes. It was fun for her because it was an easy meal after a hard day of work and it was fun for us because it was super yummy! When I lived in Florida during the late 80s and early 90s, a good friend used to have us over for crepes (see recipe below). Crepes are delicious for dinner. You can stuff them with anything from cheese, egg, and sausage, to strawberries/blueberries and whipped cream, pudding, Nutella chocolate hazelnut spread (YUM! ), peanut butter, yogurt, or just sprinkle them with cinnamon and powdered sugar. A few years ago my husband and I started a weekly waffle dinner for our home fellowship group, comprised mostly of singles. 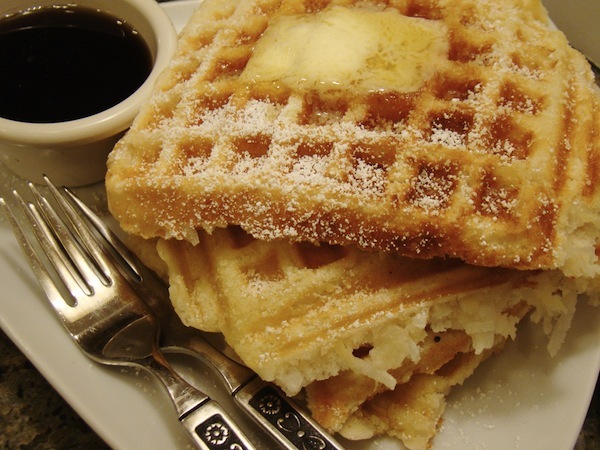 Every week we’d fry up bacon, eggs, and crisp, golden waffles. Of course, the company was good too, but the waffles really made it what it was! And no breakfast for dinner ideas would be complete without mentioning quiche! Mix dry ingredients first, add milk, eggs, and vanilla and stir with a whisk until blended. I love breakfast food anytime of the day but especially at dinner. Mushroom and Swiss cheese omelets and crispy hash brown potatoes. Yum! Swiss cheese is good on everything! One of my favs. As are sauteed mushrooms. Every spring we gather fresh tree mushrooms and man are they good…they have a wonderful texture! Mmmm…nutella is good on everything. It would probably be good on broccoli. Sugar and lemon sounds good–haven't tried that before! Im getting a small problem. I cant get my reader to pick up your feed, Im using yahoo reader by the way. Superb blog! Do you have any tips and hints for aspiring writers? I’m hoping to start my own site soon but I’m a little lost on everything. Would you advise starting with a free platform like WordPress or go for a paid option? There are so many options out there that I’m totally overwhelmed .. Any recommendations? Appreciate it! I’m happy! It is pleasant to see an individual very educated about what they do. Keep up the wonderful work and I’ll return for far more! Many thanks! I’m really inspired with your writing talents well with the structure on your blog. Is that this a paid subject or did you customize it yourself? Either way keep up the excellent high quality writing, it is rare to peer a nice blog like this one nowadays..
Just want to say your article is as surprising. The clearness in your post is simply nice and i could assume you’re an expert on this subject. Well with your permission allow me to grab your RSS feed to keep up to date with forthcoming post. Thanks a million and please keep up the enjoyable work.